Imagine practicing your English for an extra 5-10 hours every week without ever taking any extra time out of your busy day. Imagine if you could easily practice your English while you’re stuck in traffic, on the bus, cooking, cleaning, or while you’re waiting in line at market or bank. Podcasting makes all this and more possible. If you haven’t discovered the magical world of podcasts, you’re missing out. Podcasting is becoming more and more popular. According to smallbiztrends.com..
As long as you have an mp3 player, you can learn English whenever and wherever you want. Unlike the radio or television, YOU choose when you want to listen to the programs. Unlike reading books, you can listen to podcasts while you’re normally doing boring activities like driving to work/school, washing dishes, standing in line at the market, or exercising. Every single podcast in the iTunes store is free. What can be better than free? For many ESL podcasts, you’ll need to pay to read the transcripts, but the audio is always free. If you want to improve your listening skills, you need to listen to English! Podcasts are like a radio show, and if you find the right ones, you’ll soon become addicted. There’s no better way to practice your listening comprehension than being super excited to listen to the next podcast of your favorite English speakers. Don’t worry if you can’t understand everything that’s being said. If you’re actively listening, you’re going to learn a lot. The important thing is to try and understand the general idea of what is being talked about. If you have any trouble you can always…. Podcasts make it easy to be a self-directed learner. If you didn’t understand something you can rewind a few seconds and listen to it again. Or you can listen to the entire podcast again to deepen your understanding. And if they’re speaking too fast, you can slow down the podcast to ½ speed. It may take a little time to get accustomed to the iTunes store, but once you do it’s simple. One of the huge benefits of listening to podcasts in English is that are MILLIONS of podcasts to choose from (other languages are far behind—even more uneven than the fact that 52% of the websites in the world are in English). Any topic you’re interested in you can find lots of good podcasts: travel, music, relationships, food & cooking, sports & hobbies, news & entertainment, business, self-development, health & fitness, history, philosophy or science. As you can see, podcasts are convenient, easy, and free. You can listen to what you want, when you want, where you want. However, just like there are hundreds of TV shows, you probably won’t want to watch most of them. But when you find the one you do like, you can easily fall in love. It’s the same thing with podcasts. If you listen to a few podcasts you don’t like, don’t give up [don’t quit]. Be sure to listen to good number of podcasts before deciding it’s not for you. If you want to listen to ESL podcasts I have two recommendations. The RealLife English ESL Podcasts. If you’re at least at the lower intermediate level, there’s no better podcast to help you improve your English. These guys will help you learn vocabulary, slang, expressions, culture, and a little grammar in a fun and hilarious way. (Note: We may be a little biased because it’s our podcast). ESL Pod. If the Real Life English Podcasts are too advanced for you, then check out the ESL Pod. Here, they speak slowly and clearly to help you understand. While not as entertaining, they have a LOT of material that will help you improve your English and listening skills. If you want to listen to non-ESL podcasts, you really just have to search for what you’re interested in. Depending on what you’re interested in, you could love a business podcasts I don’t really like, or I could love a self-development podcast you think is annoying. To really take advantage of podcasts, you need to be able to find podcasts by yourself. Just give a quick search in iTunes, read the description, read some reviews and give a few podcasts a try! For more information on how to find podcasts click here. 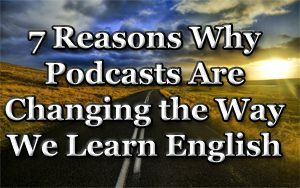 Podcasts is golden content for language learners and I agree with all seven reasons stated above. My favorite tip, though, is number five: re-wind and re-listen. The more you see a structure or word, the faster you will learn it, and best part of this? It’s contextualized!